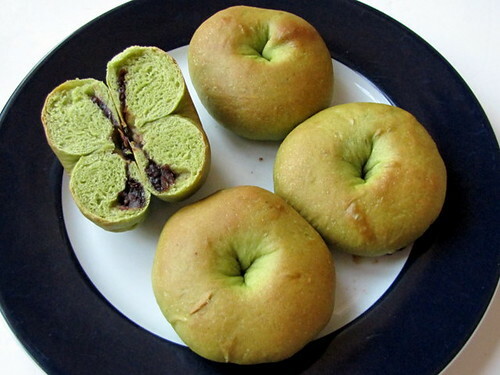 Matcha Bread Rolls with Sweet Azuki ~ I Can Do That! I was given a packet of matcha powder, compliments of Obubu Tea, a Japanese matcha producer *Thank you Ian*. The tea arrived from Japan yesterday and today I baked a small batch of bread rolls filled with sweet azuki which is one of my favorite dessert pairings. Three things I love: the mellow but distinct matcha flavor which lingers in the mouth after eating the sweet-ish rolls, the sweet aroma that greeted me when I snipped open the package, and the bright green color indicating top quality. I highly recommend it. I'm not a green tea expert but for the past 4 years I have been drinking green tea brewed from Japanese loose tea leaves. The Japanese matcha powder I have I use exclusively for making cakes, cookies, crepes, ice cream, candies, and bread. I think I drank it once but didn't like it; I prefer the brewed tea leaves. 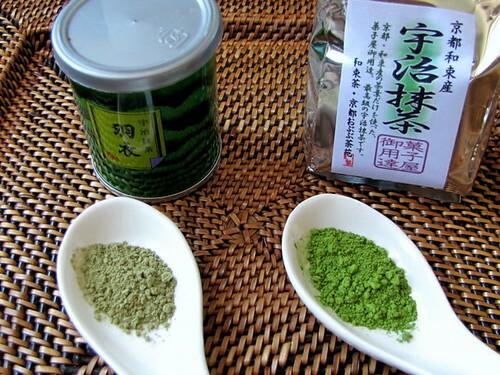 Now I know why, the very pale green matcha powder, although also from Japan, is probably old or not the best quality. In the bowl of a standing mixer with the paddle attachment, stir together 2 cups of the flour, yeast, sugar, salt, milk powder, and matcha. Add the water, butter, and egg and mix on low for 1 minute. Add the remaining flour and mix on low for 1 minute. Sprinkle with 1 tablespoon lukewarm water if the dough seems dry. Replace the paddle with the dough hook and mix on second speed for 4 to 5 minutes or until dough is smooth and supple. Transfer into a lightly greased container, cover with plastic wrap and let ferment on the kitchen counter for 2 hours. Transfer the dough on the work surface and knead lightly to release air bubbles. Scale the dough into 2½-ounce pieces, roll into rounds, cover with plastic wrap, and let rest for 20 minutes. Flatten the rounds into 5-inch circles. Using a 1-tablespoon ice cream scoop, scoop and drop azuki on the center of the circle. Gather the edges and pinch to close. Place on parchment-lined sheet pans, seam side down, 2 inches apart, and flatten each to about 1 inch thick. Cover with plastic wrap and let rise for 1 hour. Preheat oven to 350°F 20 minutes before baking. Bake for 20 to 25 minutes or until tops are light brown in color. i drink green tea a lot, but i think i like it with bread as well. the roll looks yummy. This is recherche. Finally a food coloring that is good for you. A japanese twist is what makes dainties these days even in Paris. Pandan has fragrance but I wonder if it has health benefits as well. those look too lovely to eat! 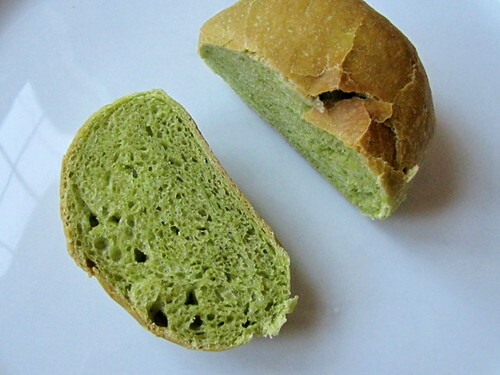 Great idea adding matcha in the bread...not only look pretty it is tasty...yummie! I think matcha also ages very quickly - you have to use it once its opened. I've found that even if I leave it open for a week, the matcha starts losing color. The rolls look delicious - and very creative. 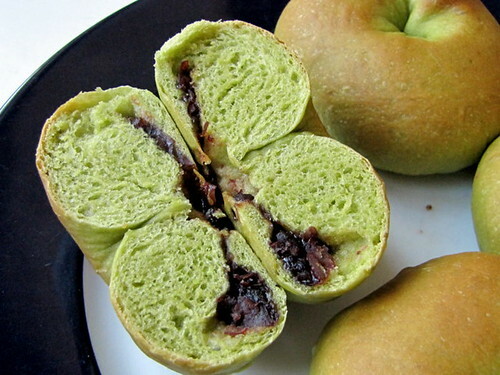 Matcha Bread Rolls with Sweet Azuki ? That looks very unique... never saw that before. I am wondering about its taste. I am always surprised at the creativity of some people. Ohhh it looks great. I love all the breads you make. Cusinera, thanks. Check their website if they have them in stores already. Kayni and Sidney, the flavor is not strong when mixed in breads but somehow enhanced when paired or eaten with something sweet like chocolate and sweet beans. Arthur, a few years ago I got an email from a friend urging me to make pandan tea (also lemon grass, cinnamon bark, etc) using fresh leaves. Apparently the whole plant, not just the leaves, has healing properties. I think it's great to be able to use these ingredients as coloring and flavoring but with healthy benefits too. Gizelle, heheh, I like eating nice-looking goodies. Juliana, I've baked regular an pan and thought why not not make it matcha an pan. Indie.Tea, yeah, the powder has to be used right away or it loses its color and maybe its potency. The one pictured on the left is about a month old but was still sealed until I opened the bag to compare their colors. I found this recipe from the Obubu site and tried it out today. I usually end up with odd-tasting breads when I try to bake them from scratch, but your recipe worked perfectly! Thanks for sharing, I'll definitely make these again! I bought a whole pound of matcha a while back. I froze half and put the other half in the fridge. It still has its bright green color and fragrance. Storing it at room temperature is not a good idea. I love this recipe! I've looked for other anpan recipes on the web, but for some reason the measurements are always in metric, and I don't own a scale haha! I've made this recipe about three times (yes, I am addicted to azuki bean paste...I'll admit it), and have had a lot of success :-).